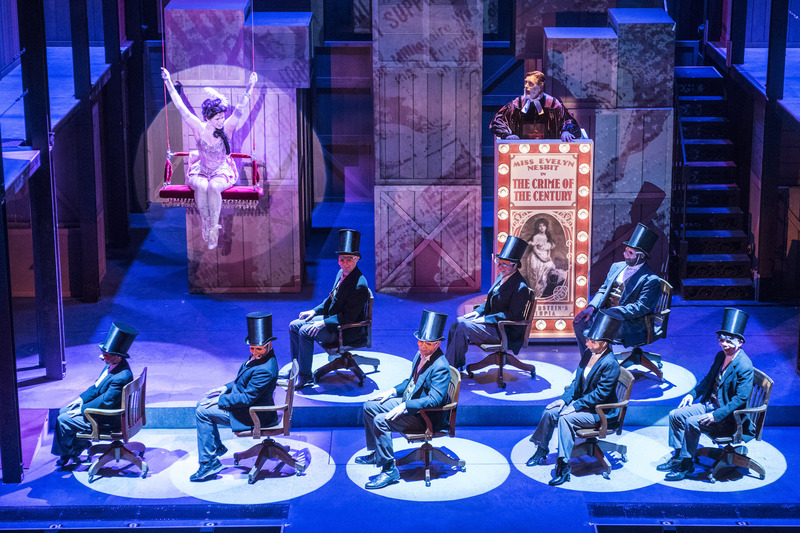 First of all, I have to thank the Pasadena Playhouse for bringing this musical back to Los Angeles…after more than two decades! 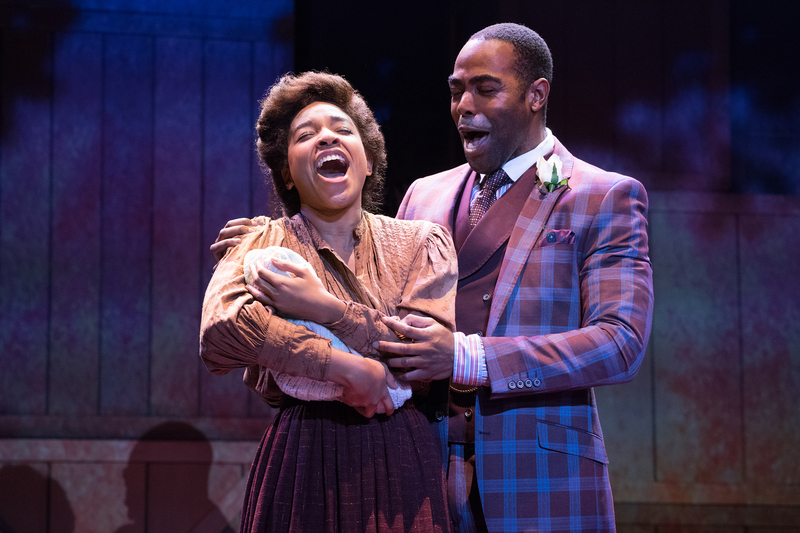 I’m thrilled that I can finally stop feeling bad about missing the original production of Ragtime at the wonderful old Shubert Theatre in Century City. On the afternoon of the performance in question, I was at the gym, (which may be why I don’t work-out anymore—I don’t want to miss anything else!,) when the call came in to my home phone, inviting me to the show that night. Back then we all had limited minutes on our cell phone plans, so I didn’t call my machine from the gym to pick-up my messages. By the time I got done working-out, (and schmoozing with the other gym rats, of course,) I arrived home too late to accept the offer of tickets for that night. 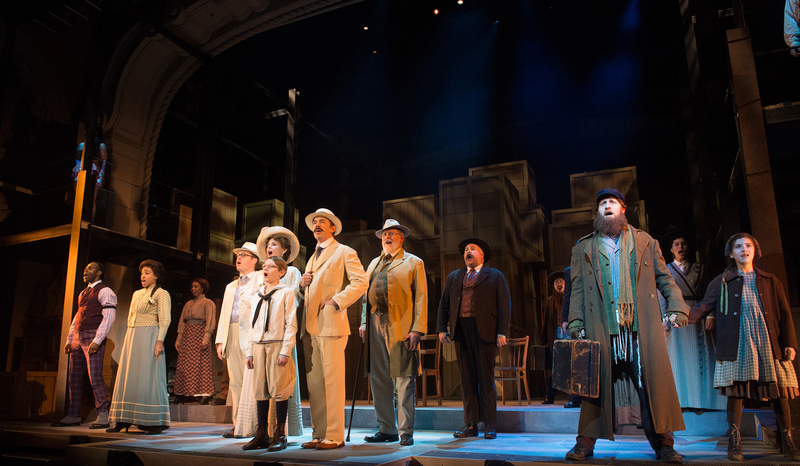 And then time just went by, and before I realized it, Ragtime’s L.A. run was over! And, I swear, I’ve felt bad about it ever since, especially since that very production was then nominated for a baker’s dozen of Tony Awards! So now that pain of never seeing the show has finally been assuaged with this new lovely and powerful incarnation in Pasadena. Photo by Jenny Graham, as is the one at the top of this page. 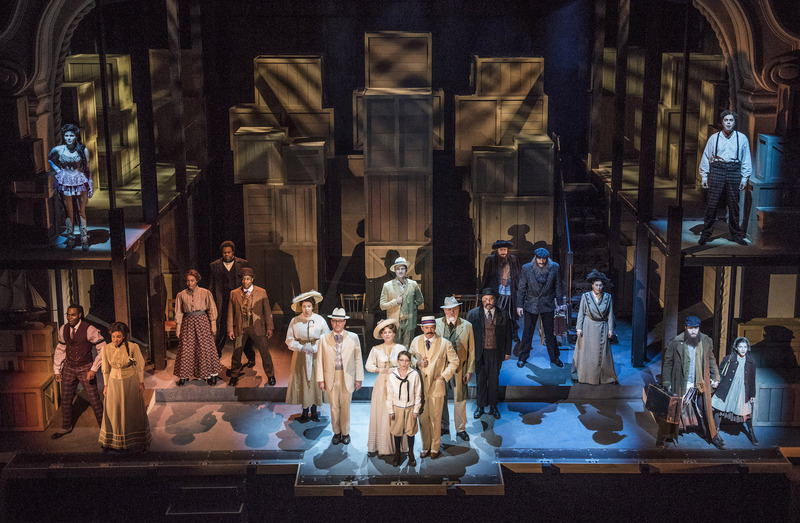 Ragtime is the story of three different ethnic groups in New York in the early twentieth century. 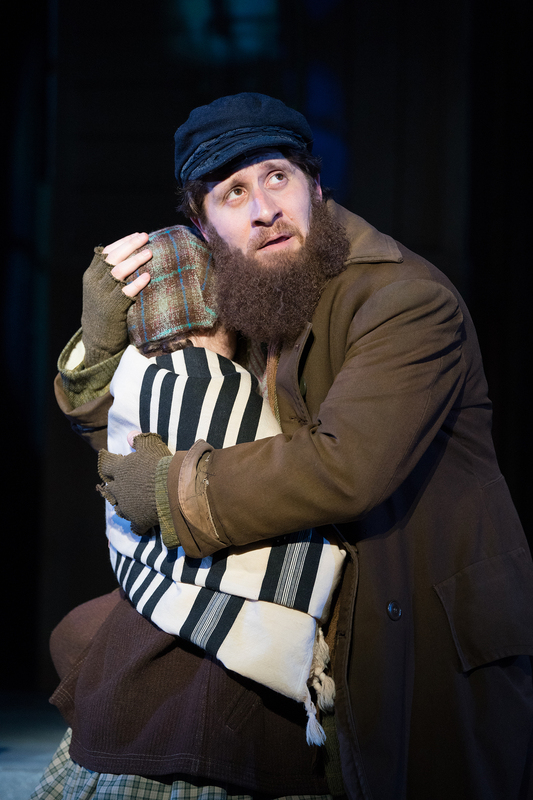 There are wealthy Caucasians, struggling African-Americans, and poor-yet-optimistic Jewish immigrants. Shannon Warne. Photo by Jenny Graham. The show is excellent and important, but I’m not great with angst. As I was trying to feel better about the injustices in the show by telling myself that, even if this story was true, it happened a long time ago, I realized that, very unfortunately, this is basically what’s occurring in this country today, fueled by the one I refer to as Orange Hitler. We still have way too many woeful situations with racism, idiots dealing with immigration in the basest of ways, women trying hard to rise up, and so much daily violence that it’s hard to watch/read the news anymore. So I was basically sad throughout the show, but buoyed by the beautiful music and fabulous performances. And by the kind and caring (and what should be considered normal) character of “Mother,” around whom a light shone for me. For a long while in the first act, it looks like the show is going to be just a series of separate anecdotes, tied together by the time period and location. But then the tales all start to come together, and it gets very interesting. 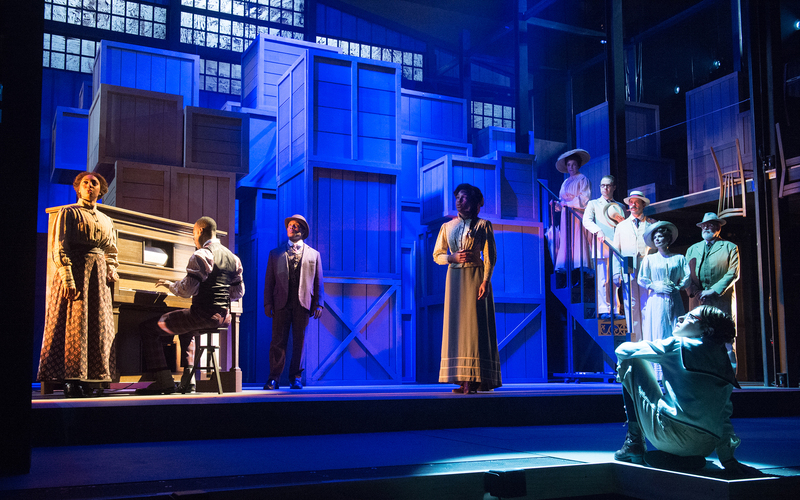 Ragtime’s scenario is told mostly in music; there’s very little actual dialogue. But that’s fine, especially with the voices we’re treated to in this production of it. Bryce Charles and Clifton Duncan. Photo by Jenny Graham. My two favorite numbers are duets. The romantic and compelling Wheels of a Dream is performed in Act I by Clifton Duncan and Bryce Charles. And Marc Ginsburg and Shannon Warne are charming together on Our Children, which is the highlight of the second act. Actually, this is the fifth Southern California musical that I’ve seen Marc in in the past year and a half (hence, making him the most working man in musicals!,) and I have to say that he gets more charming with every performance! Marc Ginsburg. Photo by Jenny Graham. Mark Esposito’s choreographed movement is great; there are no dances, per se, but there is a lot of impressive movement around all areas of the stage. Next, there are so many costume changes, for which I must pay tribute to the wardrobe department, led by Costume Designer Kate Bergh. The set by Tom Buderwitz doesn’t look like much at first, (it’s all shipping crates,) but along the way there are lots of visual treats and surprises. The many creative and informative projections, by Hana Sooyeon Kim, really help the narrative along. And I loved seeing that Model-T on stage! Being an appreciator of under-lauded talent, I especially loved that they brought the Music Director, Darryl Archibald, out front and center for the curtain call! What a wonderful move. The only two slight negatives for me are that Ragtime is waaay too long, especially the hour-and-a-half first act! At least one number could be cut from each act, but, after all, this is an old show, so it’s most likely performed now as it was originally. The other is that I can’t bear hearing the n-word ever, even in fiction. So my soul was scarred the few times it was uttered in this show. Other than those two tiny situations, Ragtime is a winner, all the way around. Don’t miss it at the Pasadena Playhouse, or like I did, you may have to wait another two decades to see the show! GREAT review! I hope I’m able to squeeze in seeing this. 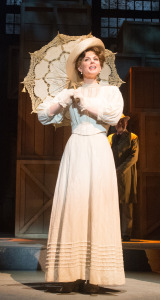 Ragtime is one of my favourite shows.